The almost 600,000 km2 that includes the Iberian Peninsula and Balearic Islands is a very diverse area in terms of climate, altitude, distribution of the territory and soil type.Oceanic influence in Galicia, northern Portugal, and the Cantabrian foothills encourages the presence of species that need high humidity conditions, due to frequent rainfall, mild temperatures and infrequent or non-existent frosts. The aridity of the Ebro river basin and southeastern Iberian Peninsula favours species with low water requirements that can survive in dry environments, heat and where there is scarce, irregular precipitation. The wide temperature variations (continental) in the interior of the peninsula benefit austere species that can withstand hot summers and freezing winters, with a very marked pattern of rainfall in the spring and the autumn. 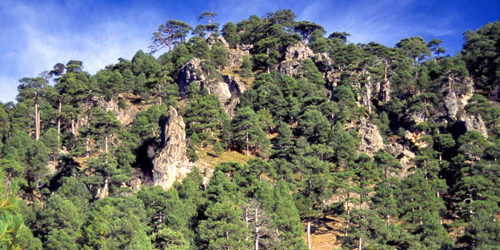 The geographic isolation of the high mountains and the insularity of the Balearics have favoured endemism (species unique to these environments). To this it is necessary to add the Pyrenean barrier and the coastal zones, which mean this region is more isolated than others. Finally, the heat of the Guadalquivir river basin encourages species adapted to a climate that is generally dry, with more or less mild temperatures and infrequent frosts. 1 The present zone of Atlantic influence on the Cantabrian coast, the northwest quadrant and the Pyrenean and Iberian mountainous regions. 2 A zone directly influenced by the Mediterranean in the extreme aridity in the southeast of the peninsula and including the Balearic Islands. 3 A vast interior area with wide temperature variations, transition zones, some more humid enclaves and other drier ones. We should also consider local and regional changes resulting from floods, landslides, fires caused by lightning, earthquakes, hurricanes, and so on. All these features mean the region can be compared to a small continent. Within very few kilometres and in a relatively small space, we find an incredible variety of landscape units and the greatest ecological diversity in Europe. In addition to these natural determinants, humans also modify the landscape as they exploit forest resources. Depending on the degree of this influence and the existing ecological balance, the landscape will be changed or modified in one way or another. For example, in a forest humans may use more of one species than another and give the woodland a different structure, eliminating competing plants or those that are not useful (cork oak groves for harvesting cork, maritime pines for extracting resin, English oaks, holm oaks, Portuguese oaks, beech, etc., to create meadows for cattle or for charcoal making, and so on). In addition, the recovery of areas affected by humans does not necessarily involve them reverting to their original state, as other very different structures or plant equilibriums may develop. A hillside becomes more eroded when it loses its tree cover. 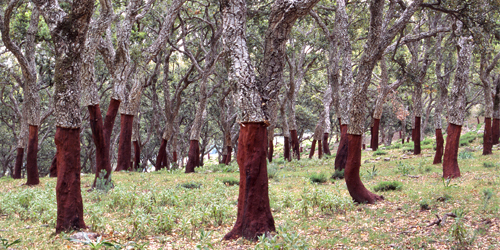 This progressive loss of soil can prevent the re-establishment of the tree that dominated the area prior to exploitation, and promote colonisation by other species more adapted to the new characteristics of the terrain. The trees we see are the result of this diversity of influences and activities. Although the areas they occupy are very variable, we can assign a dominant species to each zone in the region. So we talk about forests of holm oak (Quercus ilex), cork oak (Quercus suber), beech (Fagus sylvatica), chestnut (Castanea sativa), pine (genus Pinus), oak (Quercus petraea, Q. pubescens, Q. robur, Q. pyrenaica), Algerian and Portuguese oak (Quercus canariensis, Q. faginea), fir (Abies alba), Spanish fir (Abies pinsapo) and Spanish juniper (Juniperus thurifera). Other species have more restricted areas or are more scattered, forming small copses or appearing within mixed forests and transition zones between other dominant species: the strawberry tree (Arbutus unedo), yew (Taxus baccata), birches (genus Betula), junipers (Juniperus communis, J. oxycedrus), holly (Ilex aquifolium), laurels (Laurus nobilis), Portugal laurel (Prunus lusitanica), lime (genus Tilia), aspen (Populus tremulous), maples (genus Acer), rowan (genus Sorbus), hawthorn (genus Crataegus), buckthorn (Rhamnus cathartica), alder buckthorn (Frangula alnus), wych elm (Ulmus glabra), European white elm (Ulmus laevis), and so on. 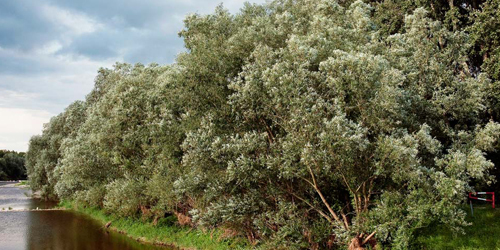 There are also species associated with humidity, that are found next to water courses or where there is a shallow water table: willows (genus Salix), alder (Alnus glutinous), poplars (Populus alba, P. nigra), field elm (Ulmus minor) and tamarisks (genus Tamarix). Finally, there are the introduced or non-native species, which have become established in the wild and occupy the ecological niche of native species, coexisting with them or even displacing them (invasive species). The tree of heaven (Ailanthus altissima) and the Siberian elm (Ulmus pumila) occur in all environments. They form stands that expand through seeding or resprouting from the stump, and they grow in ditches, roadsides, wastelands, hedgerows, gardens, rubbish tips, and even in sewers and on buildings. The various acacia species of acacia (genus Acacia), some palms (genus Phoenix), the Peruvian pepper (Schinus molle) and the tree tobacco (Nicotiana glauca), although needing the influence of the sea to make the temperatures more mild, have become established in the wild, especially in coastal zones, although there are exceptions in the interior of the peninsula. The oleaster (Elaeagnus angustifolia), white cedar (Melia azedarach), London plane (Platanushispanica), box elder (Acer negundo), some tamarisks (genus Tamarix), the black locust (Robinia pseudoacacia) the honey locust (Gleditsia triacanthos) andthe pagoda tree (Sophora japonica) form stands or copses in wasteland, ditches, central reservations and islands in roads, and are frequently given a helping hand by humans who use them as ornamental plants. In addition, some species are associated to water courses and their banks, where they have found a fantastic dispersion and colonisation route. Certain species of eucalyptuses (genus Eucalyptus), mulberries (genus Morus), pines (genus Pinus), hybrid poplars (Populus x canadensis) and willows (Salix viminalis) have benefited from plantations grown for commercial ends. These plants have dispersed from the areas forested with them and colonised other environments. 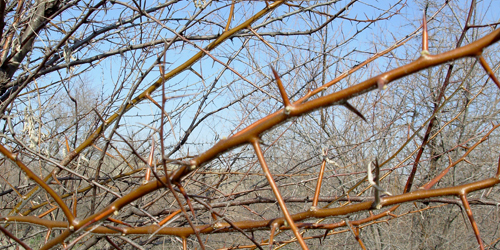 In addition, in the case of fruit trees like the almond (Prunus dulcis), the sour cherry (Prunus cerasus), common pear (Pyrus communis), the service tree (Sorbus domestica) and the pomegranate (Punica granatum), many animals have contributed to their spread by transporting their fruits and seeds. The benefits we get from trees are numerous: they produce oxygen, purify the environment by filtering out impurities and heavy metals, control erosion by stabilising the substrate with their roots, limit the impact of rain against the soil, aid water filtration by moving it down more slowly, facilitate precipitation by retaining environmental and soil humidity, moderate the temperature as their presence diminishes abrupt changes in cold and heat. Additionally, they are extremely important as producers of wood, charcoal, paper pulp, resins, flowers and fruit, and as tanning and dyeing agents and ornamental plants. As well as botanical information, Arbolapp includes literary quotes, refrains, curiosities, anecdotes, and references to the etymology of the trees and their uses. With this broad perspective, we hope that when a user finds themselves in front of a tree, they can better interpret the landscape surrounding, reading its leaves, bark, flowers and fruits, and learning about its form, shape and age.